The workshop conference Startklar?! at the Berlin Spreewerkstätten provided an important boost for digital language learning. One of the most important insights of the three-day event in March 2018 was that the distribution of roles between technology and actors in learning processes needs to be reformulated. A somewhat pixelated video is projected onto a large screen. We see B.F. Skinner, professor of psychology at Harvard University who introduced a “learning machine” in 1954 intended to enable young schoolchildren to more easily learn vocabulary or mathematical formulas. Torben Schmidt, professor of didactics of English at Leuphana University in Lüneburg, employs this brief video for his opening lecture at the Startklar?! workshop conference. Based on this example, he demonstrates how little didactic formats have changed over the past sixty years. Indeed, many of today's digital learning programmes, which have not made significant progress for learners with their closed and self-correcting exercise formats, could be introduced in Skinner’s words from back then. So it’s obvious that advancing digitisation needs new educational and learning opportunities. But how will we learn foreign languages in the future? Is there a turning point ahead for educational media? What about privacy and data ethics in the context of Learning Analytics? How do we make sure that learners’ present needs are addressed? The three-day Startklar?! 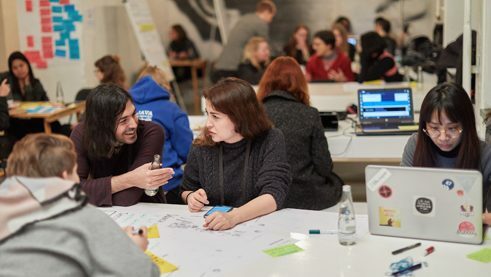 Conference, supported by the event partner re:publica, offered a necessary forum where these topics were dealt with in more detail in various workshops, clinics and a philosophical night talk. In joint talks, discussions and idea workshops, interfaces were highlighted and the course set for forward-looking project ideas. Technology is indispensable; it has truly caught up with humanity. But where others see a struggle between these two sides, most of the experts at the Startklar Conference tended to see an opportunity. In the six forums of the workshop conference, important stimuli were offered. They focused on Digital Literacy, Artificial Intelligence, Learning Analytics, Global Working Worlds, Immersive Learning and Translation Technology. And one realisation that arose in all of the forums was that the expectations of the learners need to be met. For example, Digital Literacy focus group discussed the fact that teachers shouldn’t fear that their pupils might know more than they do in some areas. On the contrary – one should draw the productive force for the common work from this scenario. Furthermore, one should also think in multifaceted ways about things like artificial intelligence, in the sense of combining the human and the algorithmic. This dilemma was repeatedly addressed: Teachers or software? Bots or teachers? Although digitisation has arrived in the general public, thus expanding the possibilities, it doesn’t have to be either/or. We have to be able to make use of the best of both worlds. Teachers are still indispensable and yet technologies such as virtual reality can create new learning scenarios. Learning Analytics gives learners a tangible tool for self-reflection and learning progress. 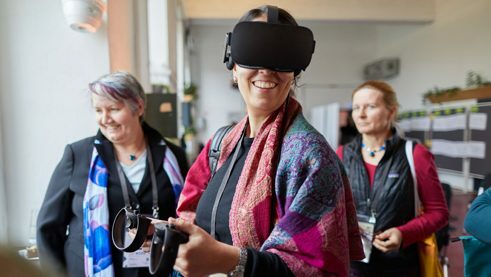 VR at the Startklar Conference | Photo: Bernhard Ludewig Educational processes are changing in the age of digitisation – and as a result, the distribution of tasks between teachers, learners and technology within learning processes is also changing. For three days, Startklar?! demonstrated this. It is important to steer and accompany this change both critically and productively. As the name of the conference implies, Startklar?! serves as the starting signal for the future. The workshop conference Startklar?! 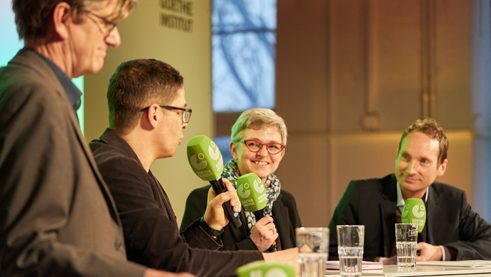 was organized by the Goethe-Institut from 21st to 23rd March 2018 in the Berliner Spreewerkstätten and supported by event partner re:publica. The goal of the workshop conference was to experiment with promising ideas for actual projects together and develop prototypes for future-proof resources for foreign language teaching and learning. At the end, these project outlines were presented and winners werepicked by a jury. A financial incentive was awarded to help the selected projects on their way to becoming reality. The fact is, everything new starts life as an idea.